If Smith doesn't strike form, this line up looks a little light in the batting department. Maxwell is the lone big hit ter in the backend. Bowling has strength with 2 good quicks and a wicket taking spinner in Tampa. 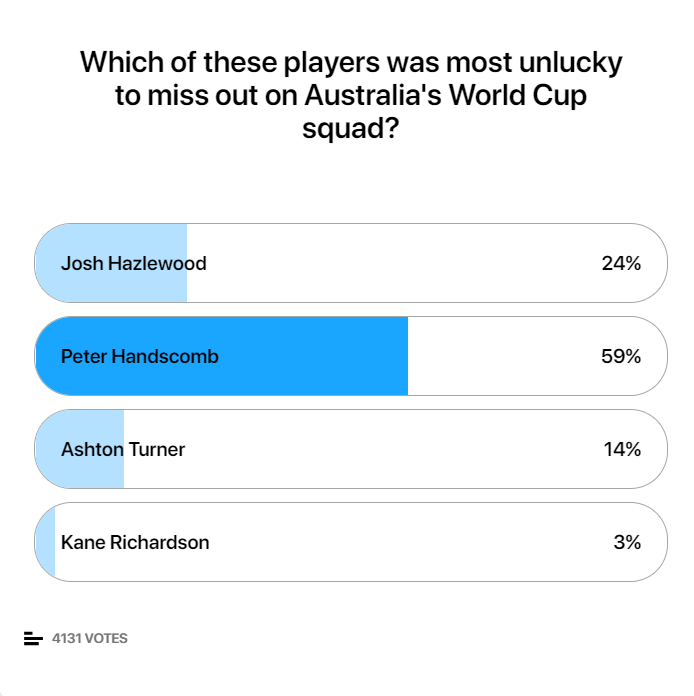 Turner was a fluke, however Handscomb must be gutted. Ind would take a Handscomb type player easily. Handscomb should have been in side for facing asian teams. He was probably their best spin playing batsman. Coulter Nile should have been dropped for hazlewood. Wasn't it Turner who won the match against India by smashing Bhuvi and Bumrah when the required rate was around 12-13 ? How is he not selected? Shocking. Turned scored 84* of 43 balls under pressure , how can they not select him? Really unfair to handscomb, he would've been a back up keeper as well . Hazlewood probably missed out because he got injured at the wrong time. Even Turner would have been an X factor, and Josh would have been handy in England. Very poor from them, without Handscomb that middle order looks pretty fragile. Lol their selections actually make sense. Those criticising this squad are gonna get served after our pathetic squad smashed by them and others. Both Smith and Warner back At least the farce of CA possibly omitting them is over now. Has England announced their squad, how come India and Australia have announced their squads early.Australian team looks solid and much more stronger than Indian team. LOL ...did any of the Bewda and Kohli combo get in their minds before the final selection ? No Turner and Handscomb ..r u kidding me.. good for us. They *ed us big time. Handscomb in place of Marsh would have been perfect.